A day without a dream is like a car with an empty gas tank. 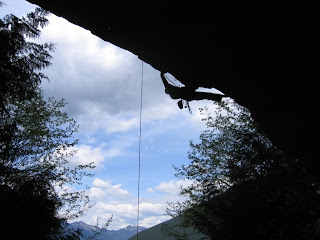 My son Tom and his wonderful wife Rachel are rock climbers. I can only wonder about what they feel after they complete their climb. 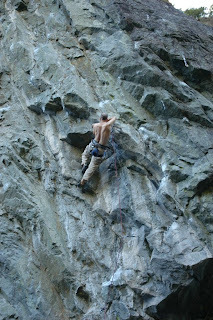 I am inspired by the rock climbing pictures that they sent me and I am in awe of their climbs. Every good thing in our lives begins with our dream about how we would like our lives to be, about who we would like to be, about what we would like to do, about what we would like to accomplish. Our dreams can come true if we are willing to climb the mountain and reach the top. The climb requires persistence, requires the courage to face obstacles and overcome them, requires faith in God and faith in ourselves when the climbing gets hard and we are afraid of falling. 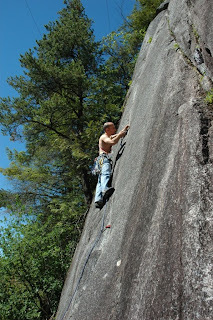 Tom hurt his shoulder and he won't be able to climb for awhile. He will heal and he will climb again because he has faith and a strong will that says, "I can and I will do it." He will continue to pursue his dream because he has already accomplished many things and there are more things that he knows he can do, because he will never give up, never quit. The musical "Man of La Mancha," has a beautiful line in one of its songs. Don Quiote sings, "Climb every mountain until you find your dream." We discover our dreams after we get our bodies in motion with enthusiasm. We discover our dream as we climb our first mountain.